It’s hard to tear you away from Bali. You feel at home among the Indonesian island’s volcanic peaks, rice paddies, and white-sand beaches. You feel at peace around its temples and yoga studios. You feel welcomed by its friendly people and boho-chic vibe. So why are you leaving? There’s a crater about which you can’t stop thinking. That’s right, a crater. Obviously, Bali has its own volcanoes. Agung is the highest point on the island. Batur is one of the most active in the Southeast Asian country. While you prefer Bratan for its hot springs. None of them has a blue fire, though. 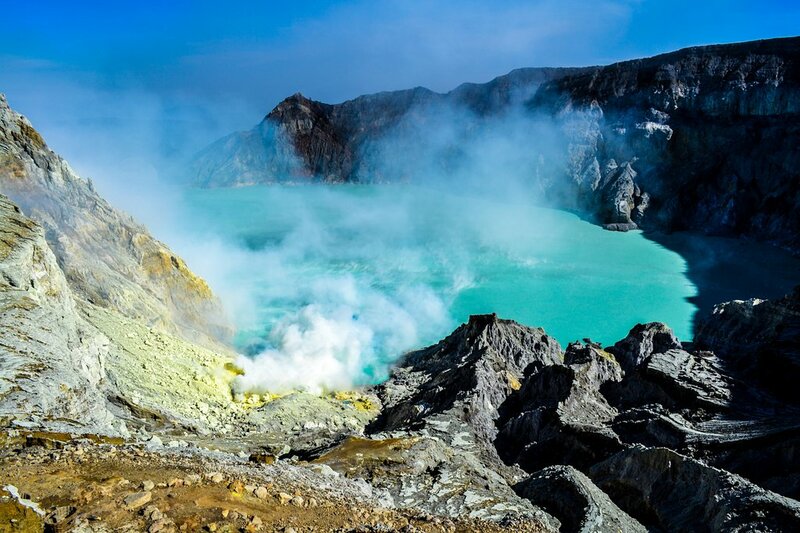 The Ijen crater sits on the easternmost end of Java, Bali’s neighbor to the west. Its caldera contains a group of stratovolcanoes. Gunung Merapi, whose name means Mountain of Fire, is its highest point. But it’s not the blue fire. That’s in Ijen, the volcano after which the entire crater was named. Ijen is where you find an acidic crater lake. It’s one kilometer wide. It has a bright turquoise color due to underground sulfur, which miners carry in baskets off the mountain. Plus, when its sulfuric gas is ignited as it comes in contact with the air, it gives off an electric-blue glow. Flames shoot as high as 16 feet. It does indeed look like blue fire. It’s a difficult, but not long, journey to reach the Ijen crater. You started yesterday when you traveled to Gilimanuk, a small town near Bali’s only national park, West Bali National Park, to catch the half-hour ferry across the Bali Strait to Banyuwangi. 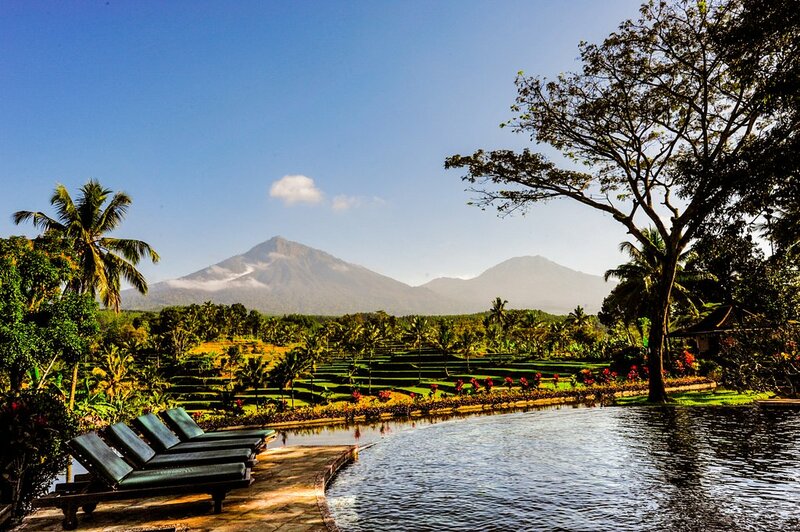 Banyuwangi sits on the eastern tip of East Java in between mountains, forests, and the sea. For its national park access, high waterfalls, and surfing swells, it’s slowly emerging as a tourist destination. Interest in the area was spurred by the Ijen crater. You didn’t head right to the crater, though. Your first stop was Randu Agung, a small village among the terraced rice fields west of Banyuwangi. It’s home to a hidden resort with breathtaking views. Ijen Resort & Villas has little bungalows with hardwood floors, quiet terraces, and pops of blue. There are an open-air restaurant and a traditional spa, as well. But it’s the lagoon-style pool with which you immediately fell in love. You had it practically to yourself until the sun started to set. For once, you didn’t linger over dinner. You ate, packed your backpack, and were in bed before you usually finish your pre-dinner cocktail. But an early wake-up call, followed by a 90-minute hike up the volcano and a 30-minute climb into the crater, awaited you this morning. The trail was wide and fairly smooth, but the smell of sulfur was suffocating at times. You pushed on. It’s a good thing you did. You were rewarded with not only a blue flame but a gorgeous sunrise and stunning views from the top of the volcano. There’s so much more to Indonesia than just Bali.